C9: Newly remodeled 1 bedroom with Charming Western Elegance and Comfort! This cozy condo was just remodeled in October 2017! If you like a little peace and quiet with no noise above you and being close to the action, then C9 is the PERFECT condo for you! Best of all, it has a beautiful view of the ski mountain at Sunlight Mountain Resort! C9 is an end unit against the ski mountain and is one level above the office, recreation room, picnic/deck area and grill with just a few stairs down to the hot tub with a picnic table deck outside your door. It is on the same level as the upper parking lot making it easy to load/unload with your vehicle just a few steps away from your door. For the snowboarders/skiers, you will love being able to ski on and off the same level just a few steps outside your door with no stairs in those clunky ski boots. There is also a deck on the same level overlooking the Roaring Fork Valley and the White River National Forest with tables, chairs and grills to enjoy during the non-winter months. This condo sleeps 6 with a queen bed in the bedroom, a queen pull-out sofa in the living area and 2 twin beds in the loft. Entertain yourself with a flat screen TV/DVD in the bedroom, living area and the loft. 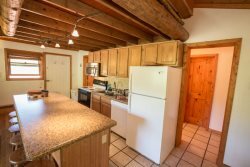 A full kitchen including a range/stovetop, refrigerator, dishwasher and microwave has everything you need to cook and enjoy your time in the room. You will have plenty of drawers and hooks, a storage area for empty luggage and ski/board racks to keep things out of the way for more living area. C9 is the perfect condo any time of year!